Is There A Massive US Gold Deposit Hidden In The Chocolate Mountains, California?? Is the US Government hiding a massive gold deposit in the Chocolate Mountains in California? Well, according to a few top-notch conspiracy theorists, the U.S. Congress passed the Desert Wilderness Protection Act that has cordoned off this vast gold discovery from the public. Unfortunately, we may never know if this mammoth gold deposit exists due to the clandestine nature of our government… or will we? Well, it seems as if the corrupt politicians have done it once again and have taken control of a vast amount of resources and wealth for their own use with blatant disregard for the public. Thus, if it weren’t for these brave souls to bring this information to the public’s attention, we may have never known there was a hidden treasure of gold in them thar Chocolate hills. In the land swap, Catellus Corp. will receive land from decommissioned military bases. One of the bases will be the Chocolate Mountain gunnery range. Unbeknownst to the public, inside the range is the world’s richest gold rift zone. Geologists estimate that the gold contained in this zone is worth between $40 to $100 billion. These are surface gold deposits which are more profitable to mine than the one-mile deep gold deposits in South Africa. Supposedly, the Chocolate Mountains contains the world’s richest gold rift zone, estimated to be worth between $40-$100 billion. Furthermore, the surface gold deposits in the Chocolate Mountain are apparently more profitable than the one-mile gold deposits in South Africa. If true, this has to be one of the biggest Gold Conspiracies ever. The price of gold in the mid-1990’s (at the time of the article) was about $400 an ounce. Thus, there would only be 200 million oz (Moz) of gold contained in the Chocolate Mountains or 6,220 metric tons. 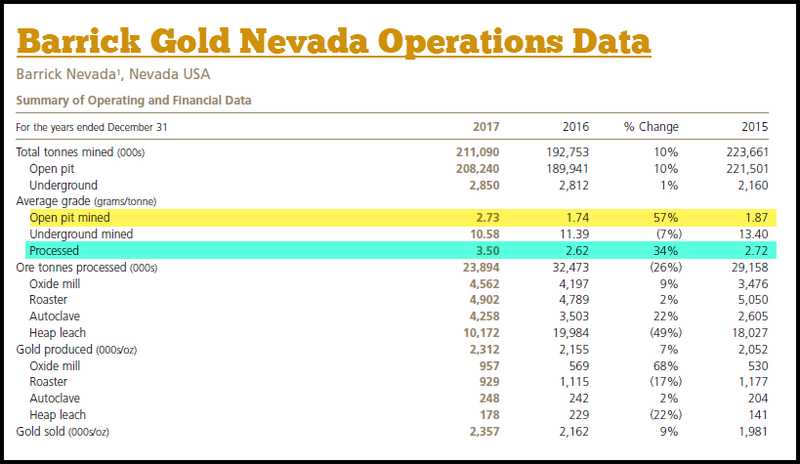 While this is indeed a lot of gold, Nevada has produced 206 Moz of gold since 1978, with the majority coming from just three mines (Goldstrike, Cortez and the Carlin Mine Operations). So, as we can see, even if there was that much gold in the Chocolate Mountains (which I doubt), Nevada has already produced more gold in the past 40 years. Also, 6,220 metric tons (mt) of gold is nowhere near a million tons. In addition to controlling Catellus, Santa Fe owns and operates the Mesquite gold mine located on the Chocolate Mountain rift zone. The Mesquite gold mine is one of the top ten mines in the United States and has some of the most profitable gold deposits of any mine in the world. To the north is the Chocolate Mountain gunnery range. The Mesquite open pit gold mine literally stops at the fence that borders the gunnery range. According to the author of The Great Gold Heist article and the gentlemen reading the article in the video above, the Mesquite Gold mine located on the southern flank of the Chocolate Mountains is one of the top ten mines in the United States and has some of the most profitable gold deposits of any mine in the world. 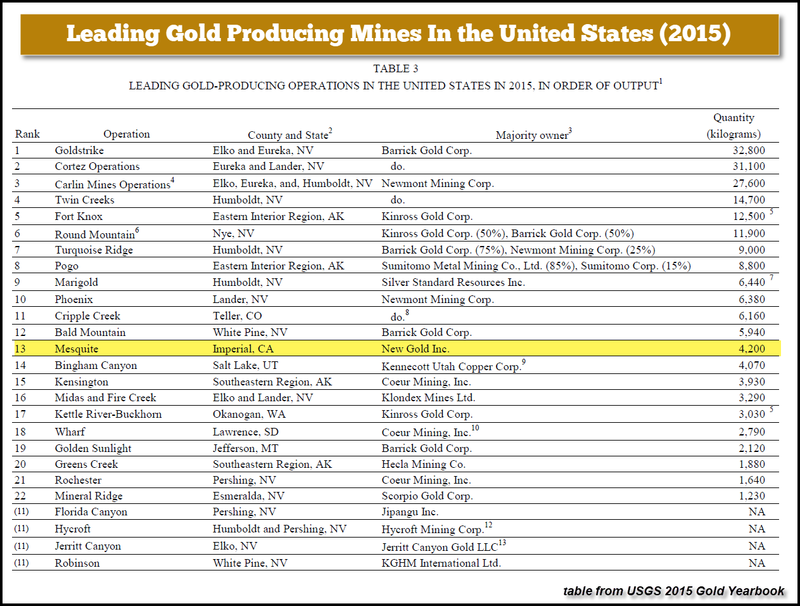 As you can see from this USGS table of leading U.S. gold producing mines (for 2015), the Mesquite Mine produced 4.2 mt of gold, approximately 135,000 oz, compared to Barrick’s Goldstrike and Cortez operations which supplied nearly 64 mt of gold (2,060,000 oz). So, how does the Mesquite Mine compare to Barrick’s or Newmont’s Gold operations? Not that well, indeed. 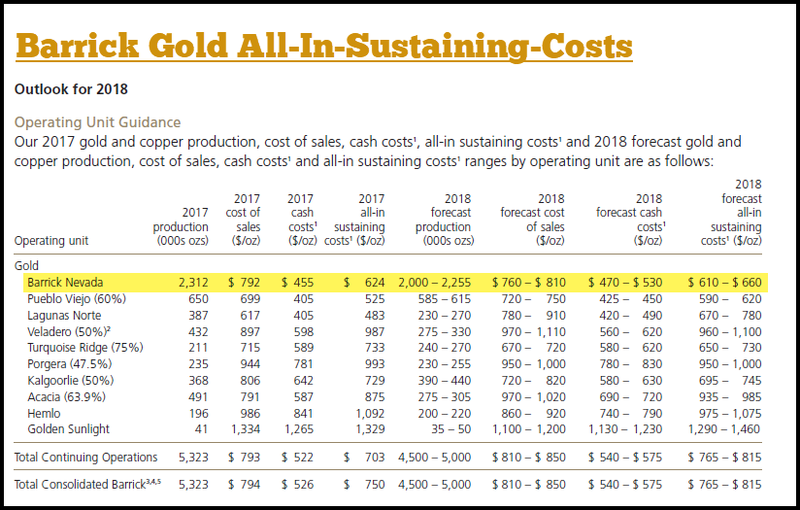 The Mesquite Mine’s “All-In-Sustaining Cost” of $1,005-$1,045 forecasted for 2018 is much higher than Barrick’s Nevada gold operations at $610-$660. Gosh, look at that…. it’s nearly $400 higher than Barrick’s Nevada operations. Please remember, All-In Sustaining Costs do not include all costs, but it does at least provide a good comparison between these two mines. 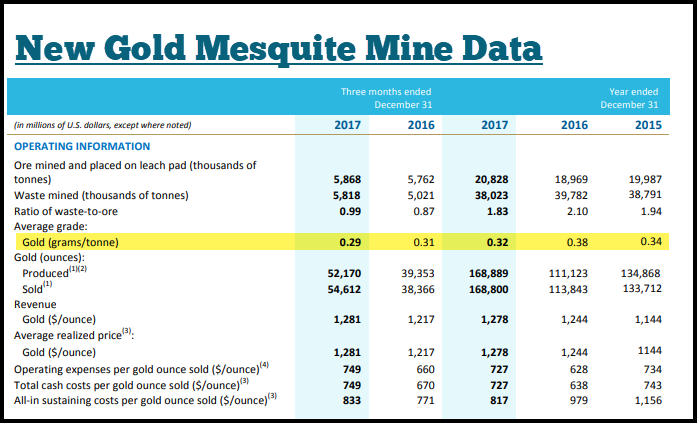 So, we can clearly see that the Mesquite Mine does not contain some of the most profitable gold deposits in the world. We didn’t even have to look across the entire globe, all we had to do was check the adjacent state of Nevada. Barrick’s Nevada operations average processed gold ore grade in 2017 was 3.5 grams per tonne (g/t) versus 0.32 g/t for the Mesquite Mine. Basically, Barrick is producing gold at TEN TIMES the average ore grade than that of the Mesquite Mine. Also, Barrick’s Nevada operations produced 2.3 Moz of gold last year compared to the Mesquite Mine at 169,000 oz. 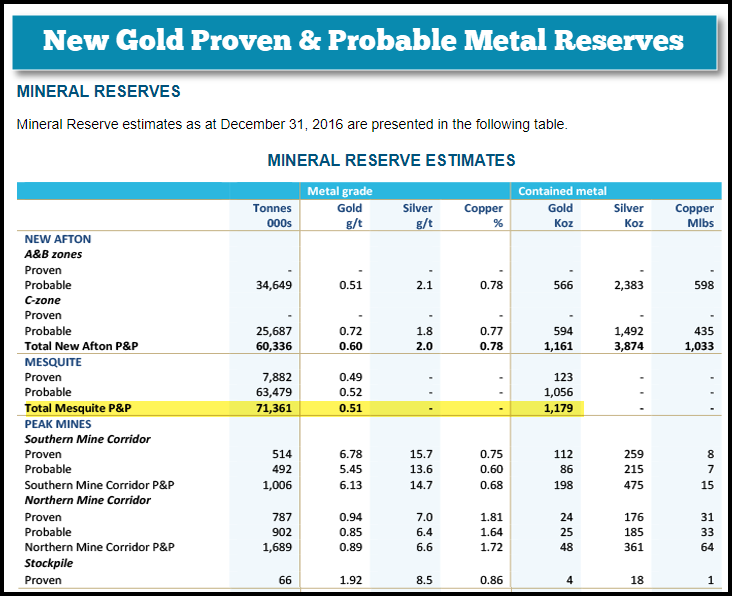 As of Dec 2016, the Mesquite Mine held 1,179,000 oz of gold in their proven and probable reserves. At current annual mine supply, this should last for approximately 10 years. And if we go to the New Gold Mesquite Mine Operations website, the mine produced 4 Moz of gold since 1985. Now how does that compare to Barrick’s Nevada operations that produced over 20 Moz of gold in the past decade? If we look at the data logically, the Mesquite Mine is at best a subpar gold producer. Thus, the theory behind THE GREAT GOLD HEIST seems to be more HOT AIR than FACTS. While there may be some gold hidden in them thar Chocolate Mountains, it’s likely very costly to produce and would need a tremendous amount of capital to set up a large enough mining operation to extract 1-2 Moz per year. Even if this occurred, it would take over 50 years just to produce 100 Moz. Lastly, if you continue to believe there are “Millions of Tons of Hidden Gold In the World,” then I would suggest it’s time to believe in Santa Claus and the Tooth Fairy.